A Review of the Institute for Research on Women, Gender, and Sexuality Oral History Project (Columbia University Center for Oral History), New York, NY, USA. The Institute for Research on Women, Gender, and Sexuality Oral History Project documents nearly three decades of feminist teaching and scholarship at Columbia University. As an oral historian and feminist, I was honored to manage this project in my capacity as coordinator at the Columbia Center for Oral History Research. Initiated in 2012 and completed in 2015, the collection examines the changing focus of feminist scholarship during the lifetime of the Institute and how those changes contributed to the overall intellectual advancement of the university at large. A website developed to showcase the project, irwgsoralhistory.org, features excerpts from interviews as well as a detailed history of the Institute and a list of those whose interviews are included in the collection. The collection was designed to ensure that it would pursue questions both specific to the Institute and relevant to broader shifts in the teaching of and research in women’s and gender studies, queer studies and sexuality studies, and critical race studies. Interviews were conducted with individuals––Alice Kessler-Harris, Lila Abu-Lughod, Marianne Hirsch, Jean Howard, Alondra Nelson, Rosalind Morris, Eric Foner, Patricia Williams, and Gayatri Spivak––who could speak to these themes and provide analysis of current and historical contexts that affected the climate in which the Institute operated. Moreover, the collection explores the Institute’s role as a political actor agitating for the inclusion of feminist analysis in courses and research throughout the university despite the lack of consistent institutional support from the larger university. Accounts of such agitation reveal the isolation that feminist scholars experienced within their home departments and the struggle to secure faculty to teach courses that were required for the women’s studies major. Additional categories of inquiry explore issues of intergenerational differences among campus feminists around issues such as activism, the development of varied feminism(s), the emergence of sexuality studies, and the challenge of addressing other forms of social difference, including class or ethnicity, theoretically and as a professional practice. One particular aspect of the collection that is specific to the Institute yet also reflective of broader changes in feminist teaching and scholarship relates to Columbia’s lateness to undergraduate co-education, which began only in 1984. The admittance of women to Columbia’s undergraduate college for the first time––thus requiring, for example, a review of course syllabi that had never included a woman author––provided a strong impetus to initiate the Institute as a space for discussing scholarship related to women. Formally established in 1987, the Institute was the only organization of its kind at Columbia, and quickly became the place where students interested in pursuing related topics, such as African American studies, ethnic studies, or gay and lesbian studies, could gather and be heard. This contributed uniquely to the Institute’s early openness to interdisciplinary and intersectional approaches to feminism as well as the foregrounding of gender and sexuality as critically important categories of analysis. Two decades later, in 2007, the Institute was acknowledged by the university as an intellectual leader in interdisciplinary and intersectional scholarship, and was granted institutional support to establish an ancillary center, the Center for the Study of Social Difference, to administer programming on a global scale that recognizes the development and significance of diverse feminisms. I offer this particular narrative––drawn from interviews with many individuals––as one example of the potential of the collection to provide researchers with rich accounts on a wide range of topics, such as the institutional support of feminist scholarship by universities, the emergence of feminist faculty leadership, and the effects of intellectual diversity on teaching and research. The collection is housed within Columbia’s Center for Oral History Archives and consists of 68 audio-recorded and transcribed oral history interview sessions with 36 individuals who offered spoken accounts of the Institute’s history. Nine of these sessions were also recorded on video. Included in the collection are current and former directors of the Institute, as well as affiliated and allied faculty trained in English, History, Anthropology, Comparative Literature, Philosophy, Sociology, Law, Public Health, and Social Work. Interviews with administrative staff who offered institutional or intellectual support are also included in the collection, as well as and current and former graduate and undergraduate students who were involved in the Institute in various capacities. In keeping with best practices in oral history, interview sessions were conducted in person and are one to two hours in length. Some additional materials are also available, such as individual and general research files that contain period self-studies conducted by the Institute to assess the direction of programming, curriculum, and scholarship. The majority of the interviews are fully open to the public, while a few contain some temporary restrictions to protect individual privacy. A detailed Finding Aid to the collection is currently in development. The Institute for Research on Women, Gender, and Sexuality Oral History Project was completed in September 2015 and the collection is currently being cataloged by the Columbia Center for Oral History Archives. Once cataloged, the collection will be accessible in a few different ways. Full interview transcripts will be available online via the Columbia University Libraries catalog (https://clio.columbia.edu/catalog/11594421). Transcripts, as well as selected research files, will also be available to view in person at Columbia’s Rare Book & Manuscript Library reading room, located within Butler Library on Columbia’s main campus. For access to the Rare Book & Manuscript Library, visitors will need to establish a Special Collections Research Account (https://aeon.cul.columbia.edu/) online before their visit. Visitors who do not have an affiliation with Columbia are welcome, though an additional temporary access pass is required; they are available on the first floor of Butler Library. Full audio and video recordings of interviews are available upon request and may require a fee for duplication. For questions or requests, please visit the Center for Oral History Archive’s FAQ, contact oralhist@library.columbia.edu, or call (212) 854-5590. 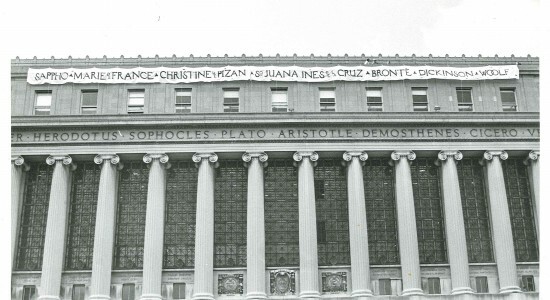 Image: Butler Library Banner Project,” Columbia University Libraries Online Exhibitions, accessed October 30, 2015, https://exhibitions.cul.columbia.edu/items/show/825.